Welcome to EV&Me! This blog is a platform for owners and drivers of all-electric vehicles and plug-in hybrid electric vehicles (EVs) to share their experiences—the good, the bad, and the funny—of driving electric. We hope you enjoy reading their stories and that their advice is helpful for those of you looking into an EV purchase of your own. New blog entries are posted monthly. If you’re interested in being included in a future entry, please fill out this form. Note that you don’t have to be a Davis resident to be included: we’d love to spotlight EV owners and drivers from all over! This blog is a collaboration between the Institute of Transportation Studies and Cool Davis. We encourage you to visit the Cool Davis website for tips and resources on sustainable living, including resources for driving electric in and around Davis. If you’re looking for additional information on purchasing and owning an EV, we encourage you to visit the California Plug-In Electric Vehicle Resource Center. The California Plug-In Electric Vehicle Resource Center offers a wealth of decision-support tools for prospective EV owners, including a list of available EVs and associated purchase incentives organized by model year and a searchable database of rebates, discounts, tax breaks, and other incentives available to EV owners in California. Finally, for a more detailed account of life with an EV, check out “500 Miles of Bolt Ownership” and “5,000 Miles of Bolt Ownership” by Austin Brown, Executive Director of the UC Davis Policy Institute for Energy, Environment, and the Economy. 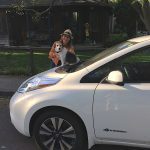 "The cost of my lease is the same or less than it would cost to lease a similar-sized gas vehicle," says Cathy Forkas of her 2016 Nissan Leaf.